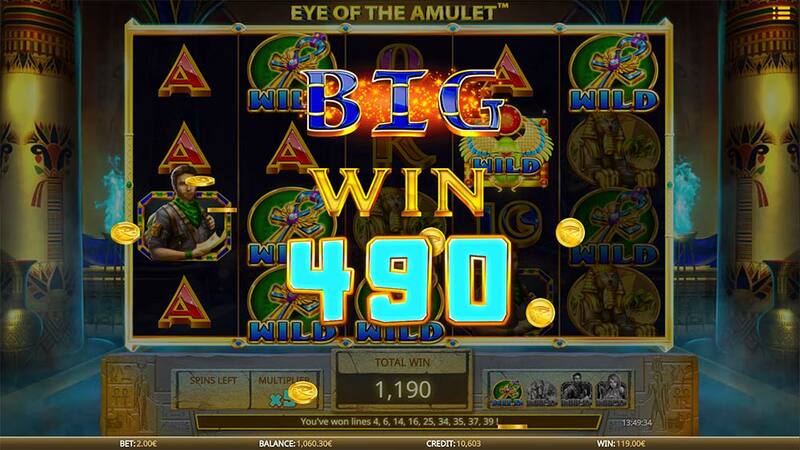 Eye of the Amulet Slot – The best slot release from iSoftbet yet? 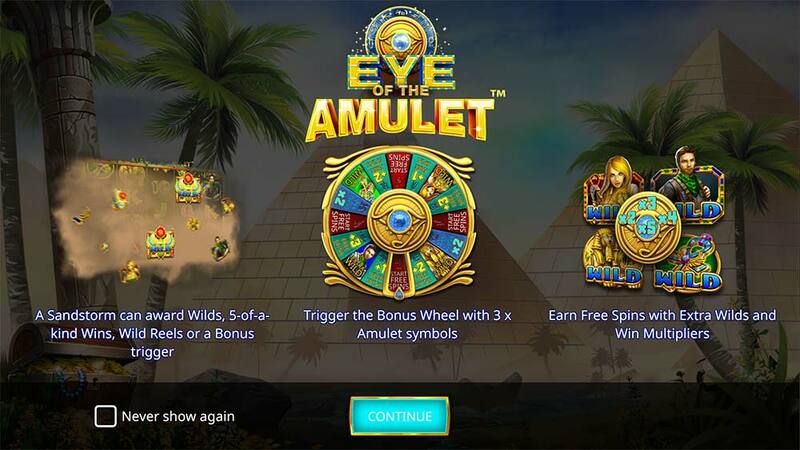 LeoVegas Casino has recently added a brand new slot from iSoftbet titled Eye of the Amulet, currently an exclusive to Leo Vegas, so for at least a couple of months, you will not find this slot at any other casino! 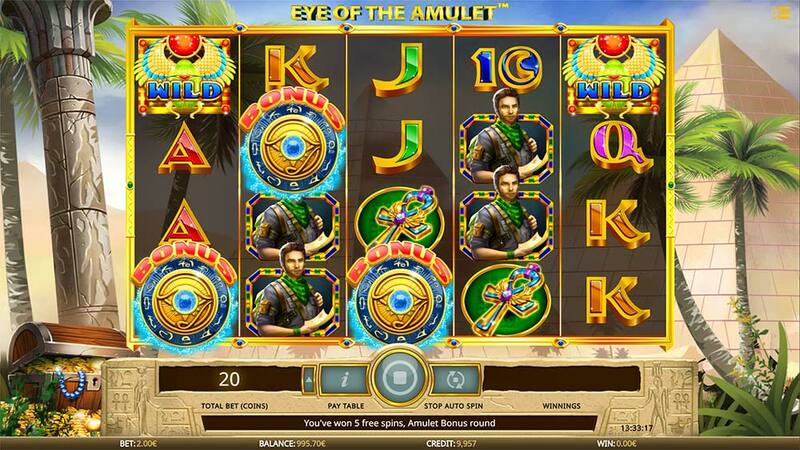 Eye of the Amulet is an Ancient Egyptian themed slot with a whole host of modern functionality, using a 5×4 reel layout and 40 fixed paylines, the design has definitely been influenced heavily by previous Egyptian themed slots with a few hats being tipped to slots such as Book of Ra (Novomatic) and possibility Montezuma (WMS) for the bonus wheel feature. 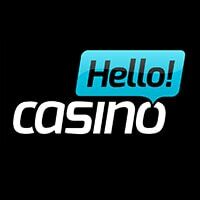 So whilst there is nothing that screams “brand new” the great news is that all of the features, particularly the interesting bonus round really do make for an impressive and enjoyable and potentially rewarding slot from iSoftbet. The bases game has 1 unique Sandstorm Feature that can trigger randomly and can grant things such as Wild Reels, Extra Wilds, 5 of a kind Wins, and even trigger the main bonus round. The main focus really though in the base game is hitting 3 or more scatter symbols to trigger the main free spins round, additional scatters increase the starting free spins with plenty more chances to increase this total. The Sandstorm Bonus can trigger randomly on any base game spin resulting in a sandstorm across the screen that can produce 1 of 4 different features or annoyingly can result in nothing too! The 4 features are as follows. 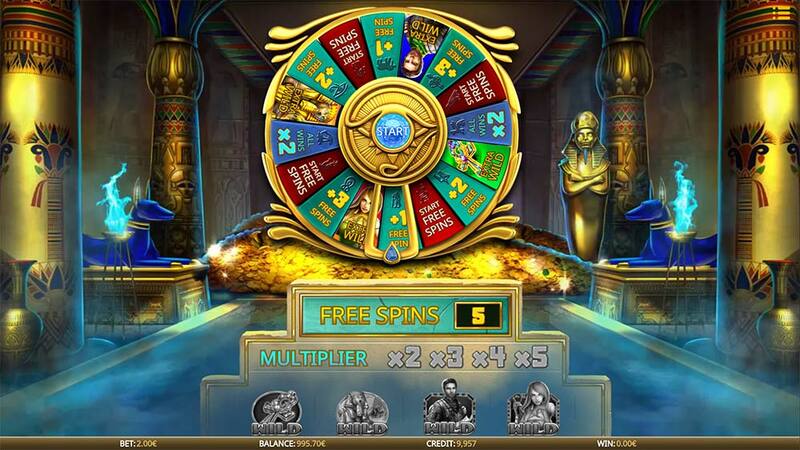 Landing 3 or more Scatters anywhere on the reels triggers the bonus wheel, additional scatters grant more initial free spins with the opportunity of earning lots of extra bonuses on the wheel before the main bonus round begins. From the Bonus Wheel, you can win a variety of different extras added to the bonus round that includes the following. Multipliers– 2x, 3x, 4x, 5x in succession. Extra Wilds – High paying symbols will act as Wild during the Free Spins. The Bonus Wheel ends when the “Start Free Spins” section lands on the pointer. 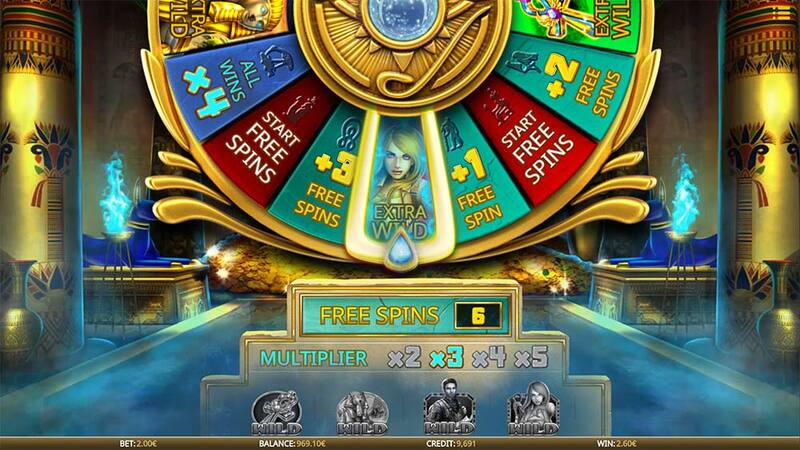 Re-Triggers are also possible during the free spins and there is also a maximum of a 100 free spins limit applied to the bonus round. 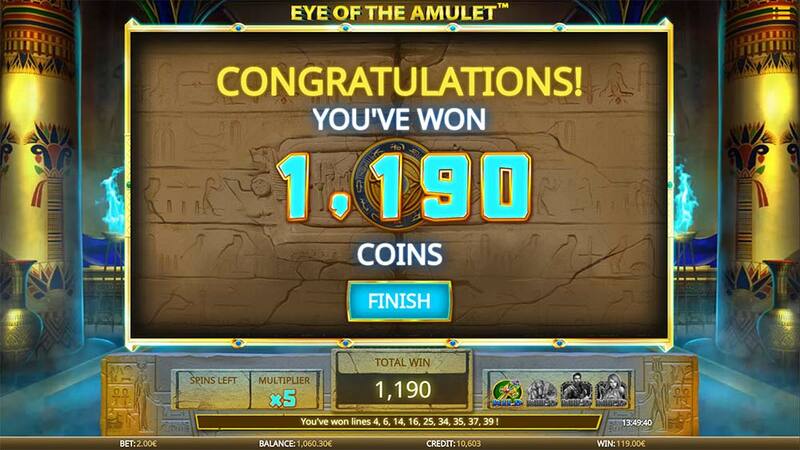 Eye of the Amulet is a very enjoyable slot release from iSoftbet, whilst the Egyptian theme has been covered many times by other developers before they have managed to add enough bonus features and a unique bonus round that definitely makes this slot worth checking out. The bonus rounds are always quite varied thanks to the additional multipliers and extra wilds along with the potential of extra free spins and re-triggers. The bonus feature alone is likely to appeal to many players seeking that chance at the “ultimate” bonus feature with 4 added wild symbols and a 5x multiplier! A slot with lots of potential, one to check out!